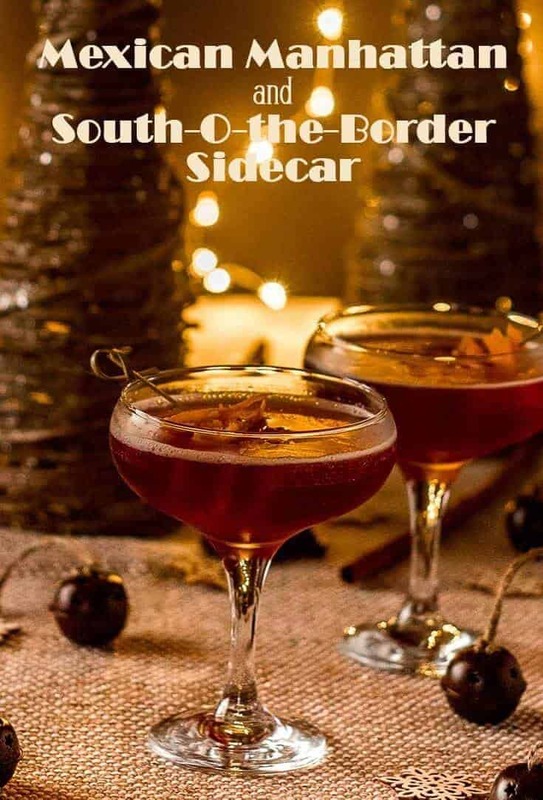 Mexican Manhattan or South-O-the-Border Sidecar? 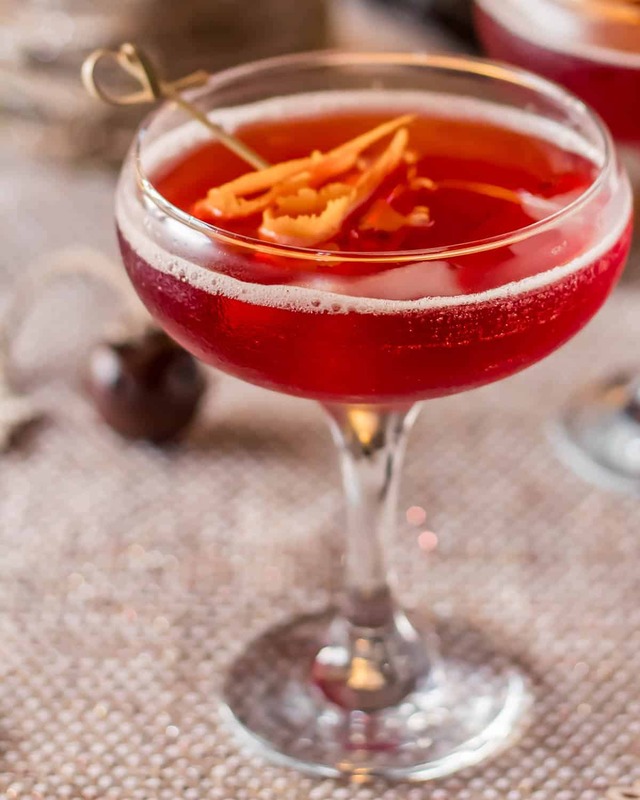 A little bit o’ spice, a little bit o’ citrus, some smooth dark chocolate in your choice of Bourbon (Mexican Manhattan) or brandy (South-O-the-Border Sidecar) … Add a dash or 5 of molé bitters, and you’re sipping your new favorite holiday cocktail! What are your favorite images during the holidays? Mine? Candles. I rarely light them but at Christmas. This year, in the midst of many storms, it seems particularly important to illuminate the darkness… Light a candle. As I have prepared for the holidays this year, I hearken back to Christmases past, the decorating, the candles lit, the crackling fireplace, the Christmas cocktail. Though Mark and I now live hundreds of miles from our families, we try to create special moments with perhaps less time and energy spent than in the past. After all, we are now two. Mark and I love bourbon. I was slow to warm up to this complex spirit… He, on the other hand, loves it straight with his cigars on Sunday. He slowly won me over. However, brandy is a lovely alternative. I use brandy in my Donner and Blitzen: A Ginger Brandy Cocktail. It yields a deeper red color, and a festive and different flavor. Which is your preference? 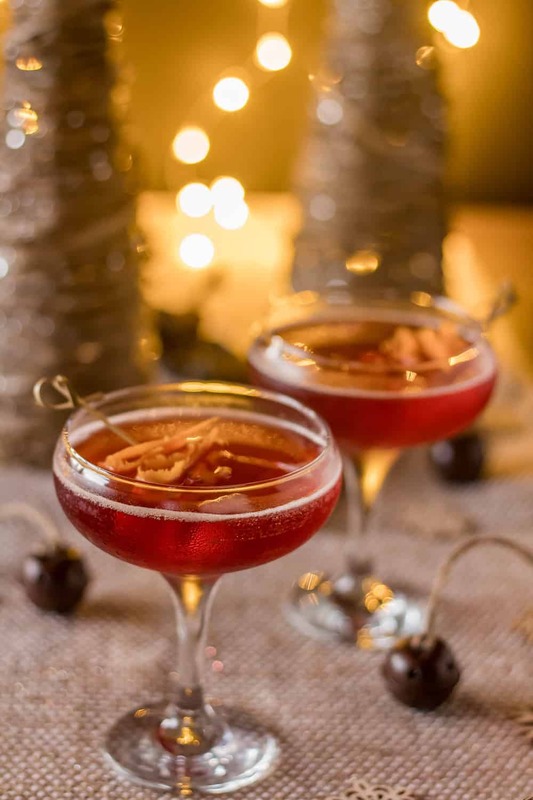 This festive cocktail comes together in about 5 minutes. SERIOUSLY. My husband made me one tonight… in 5 minutes. I ought to quantify that by saying garnishes can take practice if you’re not accustomed to making them. You will need a cocktail shaker, bourbon or brandy, a blood orange liqueur (ie. Mixologist Collection Blood Orange Liqueur), Chocolate-Chile Liqueur (for example, Villa Roma Liqueur Cioccoloto Peperoncino), and molé bitters (ie. Bitterman’s). The ingredients get a vigorous shake, a pour into a beautiful (please) 😀 glass, and a garnish of orange. Yes, it’s gorgeous and festive! Light a candle or two, and enjoy one with your loved one. I promise it’s special! 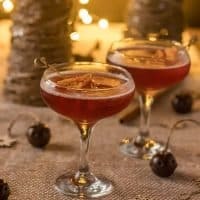 Blood orange liqueur, chocolate chile liqueur, and either bourbon or brandy get shaken and topped off with mole bitters... A festive and zesty variation on 2 classic cocktails! Add first 3 ingredients to a cocktail shaker with ice. Shake vigorously. Strain into a cocktail glass. Add several dashes of bitters. Garnish if desired. Enjoy! We love this cocktail with both the bourbon and the brandy, but as bourbon drinkers, we opt for bourbon if we have both. You may or may not have a preference. 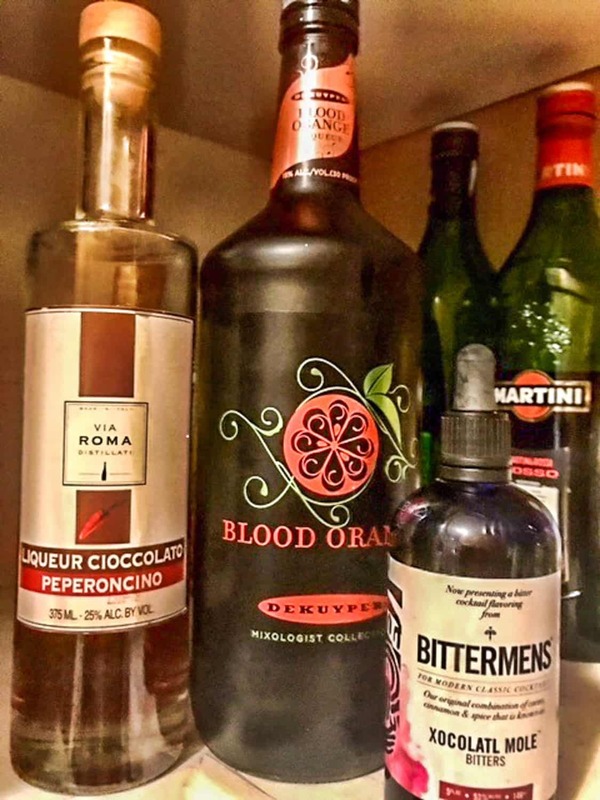 As shown in the photo, I use De Kuyper Mixologist Collection Blood Orange Liqueur and Via Roma Distillate Cioccoloto Peperoncino Liqueur. You may not be able to find these specific brands, but there are others widely available at larger liquor stores. You're looking for an orange liqueur (blood orange deepens the red) and a chocolate-chile liqueur which adds a hint of heat at the finish. The mole bitters are not hard for me to find in south Texas, but they do have them on Amazon. Substitute chocolate or orange bitters if you can't find the mole bitters. 225 calories included 1 shot each of the 3 main ingredients. Yours will vary according to brand. I think candles are super Christmasy too. I light them most of the colder months since I'm in the NE that's about half the year but extra at Christmas. This drink is really special looking. I've never had chocolate chile liquor but I'll have to try it! It sounds so good- like the adult version of Mexican hot chocolate. Thanks Jenna! Yes, you "hit the nail on the head"... The liqueur is a grownup version of Mexican hot chocolate. The cinnamon and chile really complement the chocolate, and the orange brings it all together... Merry Christmas!